I'm announcing a new regular feature we're going to have here on IHATECROCSDOTCOM. It is called, 'Emails from Newsweek readers'. We got a lot of emails from them, and some of them are interesting and fit for our site. As long time readers know, I had my Gmail account hooked up to a ticker tape machine in the drawing room in the east wing of the manor ages ago. In the past few days, I have seen the drawing room fill with ticker tape from floor to ceiling. I've had to install a new ticker tape machine, though I installed it outside, near the croquet field. Anyway, I thinking I'll be posting one new great email every few days until we run out of amusing emails. I'm an English teacher in South Korea. Generally speaking, I have a pleasant disposition with my students. Some of them I even like. One day, I found myself filled with an odd, irrational disgust directed at a particular student, a kind and well-meaning girl named Suhjin. I'd always enjoyed her, she tries hard and participates, but I couldn't shake the feeling that, for some reason, I now despised her. The feeling persisted. It wasn't an odor. Nor was it dehydration or a few nights of bad sleep. No matter how I felt, seeing her suddenly filled me with an intense revulsion. A week or so of this, and suddenly I began to feel the same way about another student. And then one of our other teachers on staff. At this point, I saw the connection. 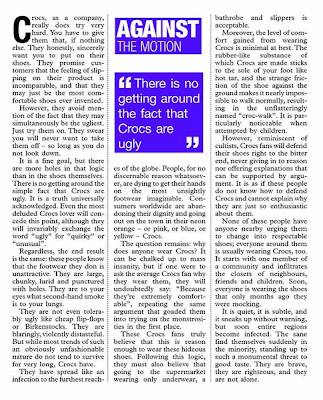 I'm not what you would call fashion conscious, and Korea is usually behind the times with everything Western, so I'd never heard of Crocs. All I knew was that I suddenly realized what was going on. It was the teacher, a short fellow named Henry. "What. The hell. Are those?" I asked, pointing to his feet. He was wearing what I would later discover were called "Designer Crocs," dark-toned, slimmer at the heel, and padded with a faux-suede fur-lining. The rest of his outfit? Business slacks, dress shirt, and tie. "What are you wearing?" I asked. My disgust with him reached profound levels. "They're Crocs!" he said proudly. I physically recoiled. "My God," I thought. "He's lost his mind." When Suhjin came to class, I realized that she was sporting a neon orange pair. I suddenly saw them everywhere. Let me be clear: I INSTINCTIVELY, and SUBCONSCIOUSLY hated these things before I was even aware they existed. I perceived them the way you might perceive, say, the sound of a humming refrigerator. Or the feel of your own tongue in your mouth. Something you know is there without realizing you know. I perceived them, and my body reacted with innate horror and hatred. I thought, for the longest time, that maybe something was wrong with me. Maybe I was just wired wrong. You know, how some people, for some reason, simply can't stand the taste of pizza or think prune juice is tastier than Pepsi. And then, saints be praised, I found your website. Thank you for letting me know that there are others like me out there. The only thing that bums me out now is the knowledge that, since Seoul is usually a year or two behind the states with things like fashion and movies, long after you all enjoy the demise of the Crocs, I'll still have to put up with them.